Calliope Piano Service – Piano tuning and maintenance for the greater Lansing, MI area. Piano tuning and maintenance for the greater Lansing, MI area. Calliope Piano Service (pronounced ka-LYE-o-pea) was founded in 1983 by Jim Alfredson, Jr. A well-loved musician in the Lansing area, Jim sought a way to support his ever growing family of seven children and studied Piano Technology at LCC in the late 70s. By the late 1990s, Jim had amassed over 1200 tuning clients. In 2007, Jim began training me, his son, Jim Alfredson III, in the art of piano tuning and repair. I inherited the full business in May of 2008 after my father’s untimely passing. I am a second generation piano technician. I take pride in providing quality and timely piano service to the greater Lansing area. I specialize in tuning, action repair, and maintenance for all makes and models of pianos with a focus on turn of the century uprights. I service private homes, places of worship, music venues, festivals, and more. In addition to acoustic pianos, I also service Rhodes and Wurlitzer electric pianos, Hammond tonewheel organs, and Leslie speakers. I am also a professional touring musician who plays all of these beautiful instruments. HOW MUCH IS A TUNING? My standard tuning rate for acoustic pianos is $110. Most tunings take about 75 minutes. Minor repairs that do not require further disassembly or parts are included in the tuning, such as sticky keys, sticky pedals, etc. If your piano has not been tuned in a long time (more than 5 years), it may need a ‘pitch raise’ in order to maintain a stable pitch. This requires multiple rough tunings in succession followed by a final fine tuning. Since this takes more time, usually between two and three hours, the cost is $175. Other common services include action rebuilding, hammer replacement, key bushing & punching replacement, key level and dipping, string replacement, pedal repair, keytop replacement, damper replacement, and more. The cost for these services varies but is based on my hourly rate of $55 per hour and I do not upcharge for parts. Please call or email for your specific needs. I accept all major credit cards as well as personal checks and cash. I can provide an invoice when appropriate or requested. Sign up for the Calliope Piano mailing list and receive 10% off your next service. Your information is private and will not be shared, sold, or disseminated. 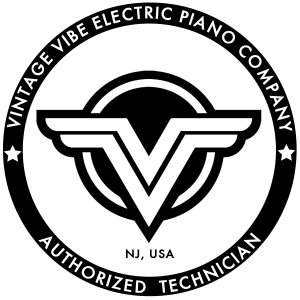 Calliope Piano Service uses vintage reproduction parts from Vintage Vibe for all Rhodes and Wurlitzer repairs.